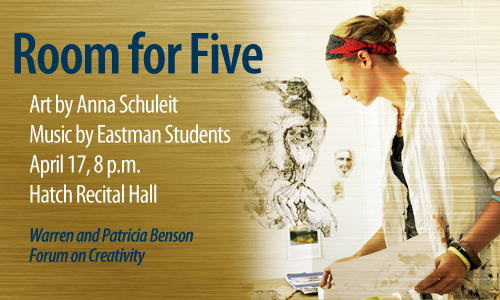 The culmination of a project by internationally acclaimed visual artist Anna Schuleit and four Eastman School of Music composers will be seen and heard on the stage of the School’s Hatch Recital Hall on Tuesday, April 17, at 8 p.m.
Room for Five represents the collaboration between Schuleit and composers Rachel Seah, Anthony Duarte, Stylianos Dimou, and Jason Thorpe Buchanan, who wrote works inspired by five of Schuleit’s large-scale canvases. The 25-foot-tall canvases will hang on the stage as backdrops when the works receive their world premiere by Eastman alumnus, pianist, and composer Daniel Pesca. Schuleit will discuss her artistic process before the performance. The event is free and open to the public. A MacArthur Fellow known for her painting and large-scale installations, Schuleit is the guest artist for this year’s Warren and Patricia Benson Forum on Creativity sponsored by Eastman’s Department of Composition. Her recent works have included 2007’s Landlines, a large-scale project that brought dozens of children together with artists, telephones, and the general public in the forest surrounding the MacDowell Colony, an arts center in New Hampshire; and 2010’s Just a Rumor, a site-specific project at the University of Massachusetts at Amherst involving a face, a pond, and wild ducks. Shuleit has been a visiting artist and guest lecturer at Brown University, Massachusetts Institute of Technology, Smith College, Harvard University, The New School, Brandeis University, University of Michigan, Boston University, Syracuse University, and other schools. Her paintings have been shown at Coleman Burke Gallery in New York, the Rhodes Art Center in Massachusetts, the Brattleboro Museum in Vermont, Mousonturm in Frankfurt, and at the Chocolate Factory in New York. Her new projects include The Voice Imitator, a creative collaboration with the composer Yotam Haber, of 104 paintings and 104 pieces for solo piano based on the short prose of Thomas Bernhard, and a set-design for Ivy Baldwin Dance at New York Live Arts. Pianist Daniel Pesca is active as a freelance pianist and composer in the Chicago area. He has performed in many university venues across the Midwest, as well as the Kennedy Center and the Chicago Cultural Center. His past collaborative partners include members of the Chicago Symphony Orchestra, members of the JACK and Spektral Quartets, and faculty at the Universities of Michigan and Iowa. 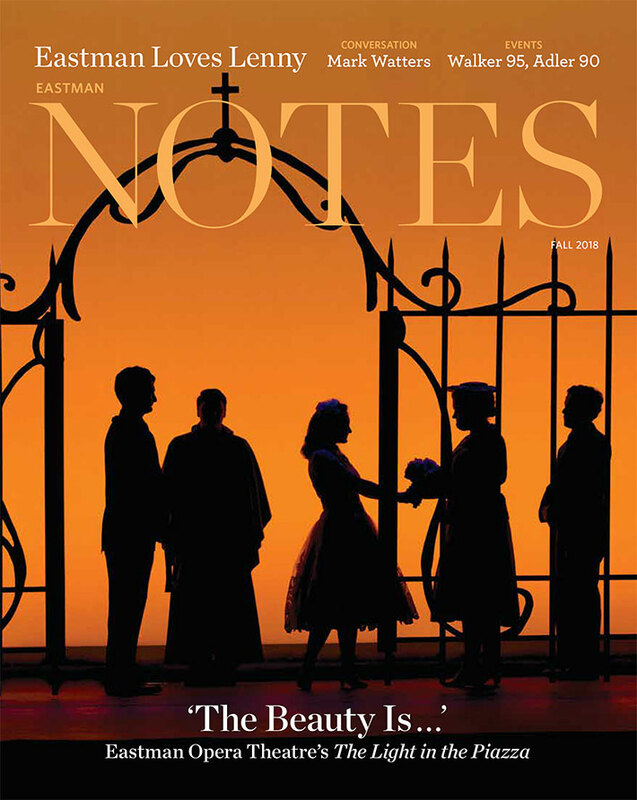 In 2012, Pesca plans recitals in Texas and Los Angeles; a collaboration with the new San Diego chamber ensemble Knell; a program of Reich, Adams and Weill in Toronto, with the Against the Grain Theatre; a recording of music by Carlos Sanchez-Gutierrez with the Eastman BroadBand; a second summer with the Aspen Contemporary Ensemble; and a performance of the Berg Chamber Concerto with Buffalo’s Slee Sinfonietta. The Warren and Patricia Benson Forum on Creativity is an annual event curated by Associate Professor of Composition Carlos Sanchez-Gutierrez, with the aim of encouraging an open discussion on the nature of creativity across artistic disciplines, and is made possible by a generous gift from Warren and Patricia Benson. Mr. Benson was professor of composition at Eastman from 1967 to 1993 and was appointed Professor Emeritus in 1994. He died in 2005 at the age of 81. Hatch Recital Hall, Eastman School of Music, 433 E Main St.